* What is the author's purpose in writing this story? How can you tell? * Do you think the author could have made the story more interesting? How? * Which details helped you form a picture in your mind? How did these details help you? 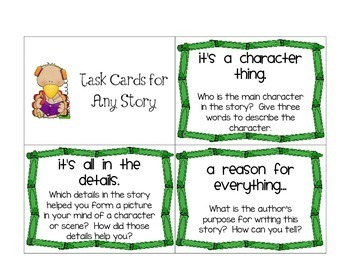 These cards could be used for group work, individual work, or as classwork. Using task cards instead of worksheets also saves valuable copies and ink.